Industry 4.0 - is it all about industrial data and analytics? Industry 4.0 – is it all about industrial data and analytics? Sometimes answers are in the questions you ask. That certainly goes for the one in our headline: is Industry 4.0 all about data and analytics? You bet it is, but then in the broadest possible sense of data and not overlooking other crucial aspects. Is there anything in new technologies, the information age and, indeed, Industry 4.0 or the fourth industrial revolution (as some prefer to call it) that isn’t about data? From industrial technological realities such as the IoT (Internet of Things), robotics, digital twins, additive manufacturing and augmented reality to the development of innovative services within an ecosystem approach: it’s data, data and…analytics everywhere. Data as the proverbial new oil in general, data as the lifeblood of the ‘digital’ factory and data as business asset since quite some time now – or so it should be, including the proper measures to protect, treat and value it as you would any business asset. 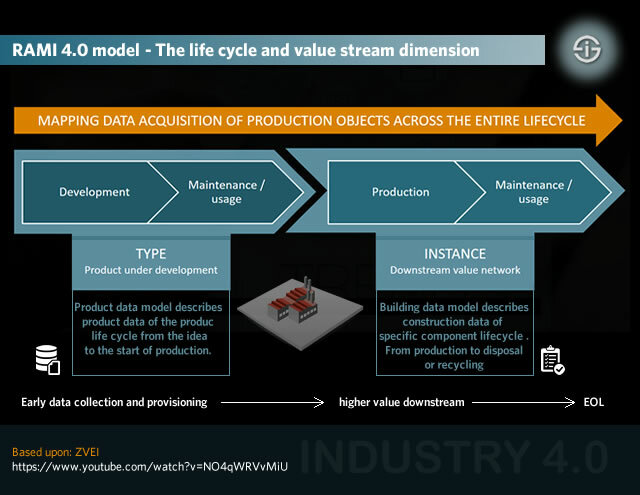 In fact, if you look deeper into Industry 4.0 and some of the key aspects of its RAMI 4.0 reference architecture model such as the life cycle and value stream dimension of “Reference Architectural Model Industrie 4.0”, you immediately see that it’s about data, all the way from early data collection and provisioning during the development stage to all other stages across that entire life cycle until the end of life or EOL. The exact same thing goes for Logistics 4.0. Obviously when we speak about data we mean actionable data which lead to information, knowledge, insights and any other form of data-driven intelligence and analytics where artificial intelligence and cognitive come in the picture, that enable several goals. These goals, as well as the data activities, stretch across the entire value chain and product lifecycle as is depicted below: from ideation, prototyping and development to maintenance, production and ecosystems of information driving innovation, logistics and pretty much any industrial process, all the way to disposal or recycling. Yes, but what about all the other aspects beyond technologies, data and the many dimensions of Industry 4.0 in terms of applications and areas of value generation in smart manufacturing and industry? What about organizational dimensions going beyond, for instance, direct goals such as enhanced maintenance, better asset utilization, automation and collaboration between man and machine, better quality management, new production techniques and so forth where data also play a key role? What about all the change aspects of industry’s digital transformation? And what about the human aspect, for instance? Industry 4.0 is also all about people. It’s people that collaborate with cobots, have to be trained, need new skills in several cases (and at the end of the day still quite some older skills if Industry 4.0 wants to succeed), need to be able to leverage data, still need to be able to maintain and repair, the list goes on,… Of course they do matter a lot, as do processes and much more. But somewhere data is always present, it just depends on how you look at it. In a blog post, Andy Rowland of BT writes that data is fuelling the growth of Industry 4.0. It certainly is and as Andy points out only a very small percentage of industrial data is currently used in a way that makes sense or adds value (an issue that is not just affecting Industry 4.0 and industrial data but pretty much all data-related activities and requires people and brains too by the way). One of the classic challenges as we know it in most information management and data environments: silos. In Industry 4.0 and industrial data these silos range from ERP (enterprise resource planning) and industrial control systems to traditional documents, both digital such as good old spreadsheets and – more often than thought – still in paper format too. Silo issues that indeed need to be solved by people who understand the gaps, can formulate a strategy, understand the processes, are able to solve the silo issues, bring in the right systems and put you on a path of the journey and vision which is called Industry 4.0. For Andy, Industry 4.0 is all about collecting industrial data from various sources into a data lake and then unleashing the necessary analytics, artificial intelligence, machine learning or cognitive if you like to predict equipment failures and streamline production processes. It’s indeed one of several ways data is leveraged using advanced analytics to achieve one or several of the typical Industry 4.0 goals. There are more but Andy’s blog post gives an example for those who look to see the gains that can be made by using predictive analytics for predictive maintenance (or failure likelihood). The case concerns electric submersible pumps in oil and gas whereby operators (people) can offer prescriptive guidance on the extension of the life of this pretty expensive equipment (spare parts cost $500,000 and were kept in close range to avoid disruption), based upon a range of factors and parameters (197 to be precise) concerning 200 monitored pumps with close to 1,000 analytics models for a total of three million records a day and a 20 percent efficiency gain in two man months of work. That’s indeed a lot of analytics and industrial data. And industrial data needs to be secured too as you can read in Andy’s blog post.